Those lightweight, polystyrene containers that some restaurants give you for carrying home leftovers or take-out meals are known in the foodservice industry as "clamshells." Their hinged-lid construction indeed resembles the architecture nature uses for clams, oysters, and other familiar bivalves. Every year, billions of these clamshells and other foodservice containers made from petroleum-based foams end up in already overstuffed landfills. Slow to decompose, they become yet another environmental burden. But the containers, along with other disposable foodservice items such as plates, bowls, and cups, can also be manufactured with biodegradable ingredients. ARS plant physiologist Gregory M. Glenn is working with EarthShell Corp., the California-based innovators of potato-starch-based foam products such as burger boxes, to create environmentally friendly disposables made with starch from wheat, the world's most widely planted grain. His wheat-starch-based prototypes are sturdy, attractive, convenient to use, and just as leakproof as their polystyrene counterparts. Glenn is with the Bioproduct Chemistry and Engineering Research Unit at ARS's Western Regional Research Center in Albany, California. Why use wheat starch in packaging? Because it offers manufacturers of foodservice products another choice among starches when they're buying raw materials. That purchasing flexibility can help keep their prices competitive with the polystyrene products. Another important cost savings: The machinery already used to make EarthShell's potato-starch-based containers is suitable for the wheat-starch products as well. That sidesteps the need for costly retooling at manufacturing plants. "The machines are presses or molds that work something like giant waffle irons," explains Glenn. "First, a wheat-starch batter is poured onto the heated mold, which is then closed and locked. Moisture in the batter generates steam that, in turn, causes the batter to foam, expand, and fill the mold. The steam is vented and, when the baking is finished, the mold is opened, the product is removed, and the cycle starts again. This whole process takes less than a minute." A water-resistant coating, added later, helps the container keep its strength and shape when it's filled with a hot, juicy cheeseburger or creamy pasta alfredo leftovers, for example. But once the container hits the backyard compost pile or municipal landfill, it biodegrades in only a few weeks. Perhaps having our ready-to-eat meal packed for us in a guilt-free throwaway container, such as a wheat-starch-based clamshell, will make eating those foods even more enjoyable.—By Marcia Wood, Agricultural Research Service Information Staff. Gregory M. Glenn is in the USDA-ARS Bioproduct Chemistry and Engineering Research Unit, Western Regional Research Center, 800 Buchanan St., Albany, CA 94710; phone (510) 559-5677, fax (510) 559-5818. 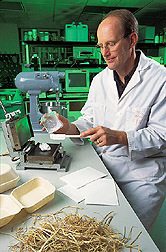 "Wheat—A New Option for Carry-Out Containers" was published in the September 2004 issue of Agricultural Research magazine.